Enter now the Exclaim! 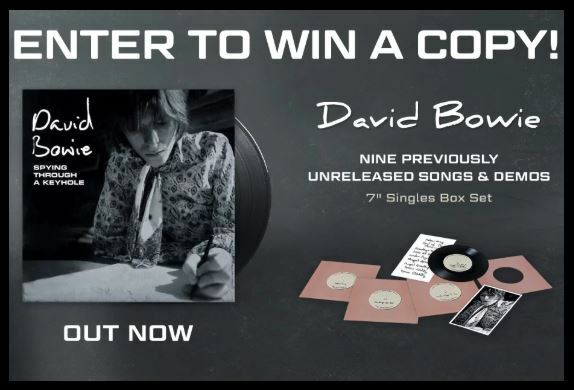 Contest, in it, you could Win a David Bowie box set of Spying Through a Keyhole (Demos and Unreleased Songs). To enter you simply have to visit the official contest web page and fully complete the online entry form with your name, email address, mailing address, city, province, postal code, phone number, age and your answer to the question “What song is a demo from 1968?”, agree to the rules & regulations and submit it. Contest ends at 10:00 am on May 15, 2019. Winner will be selected at random from all eligible entries. There is one Grand Prize, consisting of a set of David Bowie's 'Spying Through a Keyhole'. The Exclaim! Contest begins on April 5, 2019 and ends on May 15, 2019. The draw will take place on May 15, 2019. Winner will be contacted by email.